“An event like the Winter Olympics receives delegations from all over the world, so you might have an impression that the circulation is free in the world. But it is not,” Akram Zaatari said in an interview with The Korea Herald on Friday at the Gangwon International Biennale 2018 in Gangneung, Gangwon Province, a subhost city of the upcoming PyeongChang Winter Games. Zaatari’s collection exhibited at the biennale comprises 48 photographs of Palestinian, Syrian and Lebanese prisoners detained in a prison in Israel for political reasons. With the collection of photos who are detained, Zaatari attempts to highlight that many people still do not have access to an event like the Olympics. While the international sporting event seeks to promote harmony, peace, equality and coexistence on a global scale, it is falling short in the eyes of Zaatari. 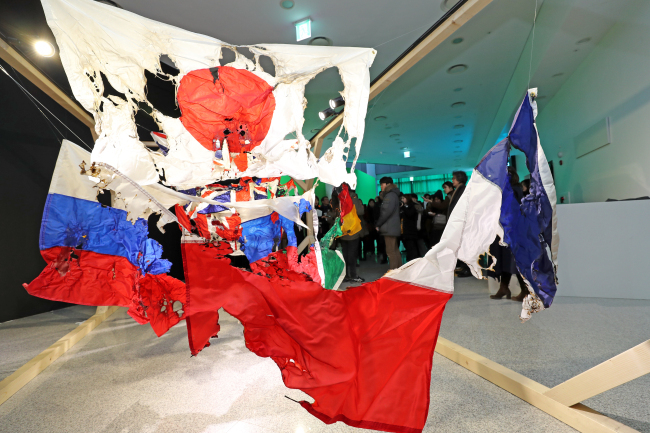 Opened Saturday, Gangwon International Biennale 2018 -- one of the main cultural events alongside the PyeongChang Games -- is dedicated to exploring uncomfortable yet ongoing tragedies affecting innumerable lives around the world. Under the theme of “The Dictionary of Evil,” the local biennale presents visitors with 110 works of art by 58 individuals and teams of contemporary artists from 23 countries, and is devoted to pointing out various societal issues around the globe. Participating artists from abroad include Akram Zaatari, US-based Lebanese artist Walid Raad, Swiss artist Thomas Hirschhorn, Forensic Architecture, artist collective Chim pom and sculptor Rafael Gomezbarros. From Korea, installation artist Kim Seungyoung, documentary film director Park Jong-pil and artist Shim Seung-wook have joined. Also included is Lee Wan, who exhibited his work at the Venice Biennale last year. The works are displayed in Hall A and Hall B. Hall A mainly displays photographs and media art. It presents Thomas Hirschhorn’s “Pixel-Collage” series that attempts to reconstitute the world of violence through grotesquerie images. Walid Raad’s “Index XXVI: Yellow and Red” is also located in Hall A. Raad’s works convey the contemporary history of Lebanon, with an emphasis on the wars in Lebanon between 1975 and 1991. Zaatari’s photo collection is located on the other side of the same room. Korean activist and independent documentary film director Park Jong-pil’s works -- including “The Report on the Battle for Disabled People’s Right to Mobility－Let’s Take a Bus!” and “Nodeul Baram,” referring to the wind of Nodeul dock -- seek to cast light on marginalized populations in South Korea. Hall A also houses “House Taken” by Colombian Rafael Gomez Barros, a figurative representation of refugees, uprooted immigrants and other people separated from their homes, through 400 pieces on the walls. Entering Hall B -- built especially for this biennale -- Shim Seung-wook presents performance art piece “Stabilized Anxiety: The Stage of Eight Stories,” in collaboration with dancer Choi Soo-jin from the Korea National Contemporary Dance Company. Choi dances inside a cage over a voice telling eight tragic narratives originally based on the stories provided by Good Neighbors and Doctors Without Borders. Behind the cage is “Tower of Babel” by Korean installation artist Kim Seung-young. Forensic Architecture, an independent research department at Goldsmith’s College of the University of London, also provides a 3-D model of M2 Hospital, one of the two hospitals in Aleppo damaged by 14 bombings between June and December 2016. Also included is Singaporean artist Han Sai Por’s “The Black Forest,” an installation using recycled wood, charcoal and ceramic bones. With the work, Han Sai Por seeks to raise awareness for the conservation of tropical rainforests in Southeast Asia. The art biennale runs through March 18.